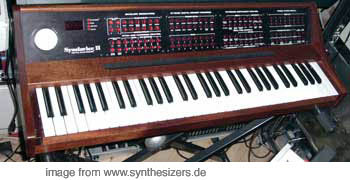 it has 3 MIDI Ports for the obvious tasks and another 3 for DIN Sync and you can assign those 2 DIN Out Ports to clock with 24 or 48 clicks so you can use Korg and Roland DIN machines in nice sync and there is CV and Gate for analog connection as well. – so this is the first real „analog“ interfacing device from Roland since the SHs. and it has USB to connect it all to the computer. Note this is what machines like the TR707 may have done to you before, it can be the Master to keep track and sync all vintage stuff to the new ones and it has SHUFFLE .. so this is where to press play on, continue and tap in your tempo for ALL machines as a master clock. 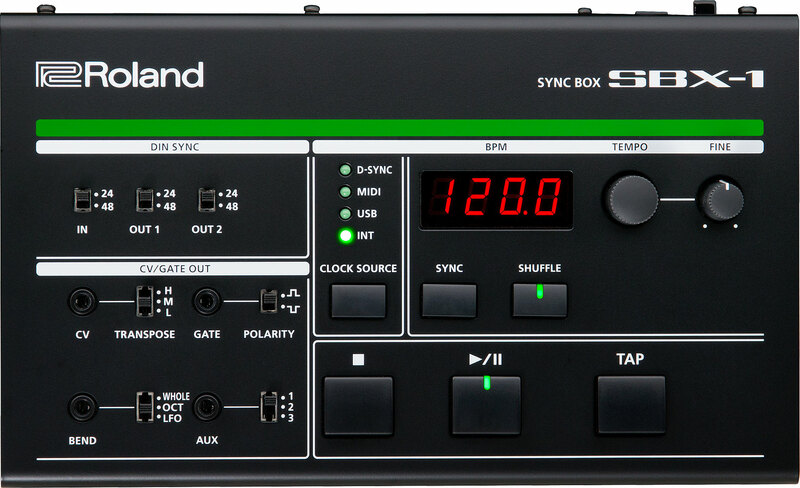 Mit diesem Teil gibt es eine Swing-fähige Masterclock für alles, was an DIN, MIDI, USB und auch CV/Gate Signalen anliegen muss um andere Geräte im Tempo zu halten: Roland – SBX-1 (Syncbox) im Forum. 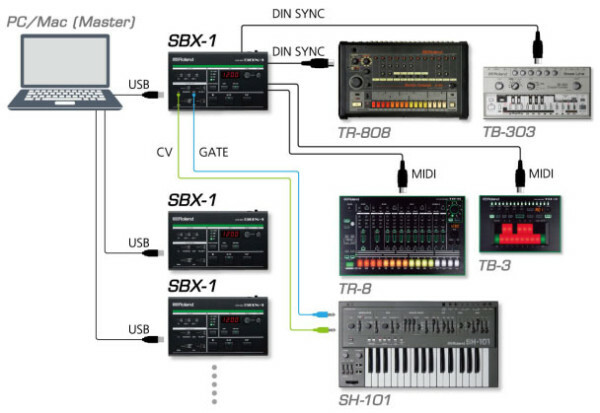 Sync Examples – they also add to use 5pole Cable for DIN Sync (of course) since MIDI is only 3 Pins connected instead of all 5 – important. Hi there,I’m having trouble using midi out of my roland tb3 into midi in of my roland tr8. It doesn’t work. I also tried midi out of my tb3 into midi in on my akai mac 2500 so I can record loops but that doesn’t work either. I’d like to also know how to trigger my tr8 via my tb3 through midi. 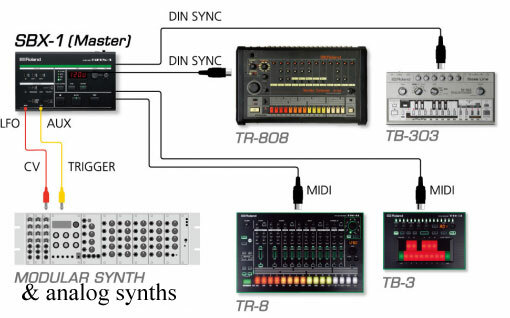 well – it’s just that standard midi clock, that has to be set to auto/external on the receiving dev (tr8) and midi out of the tb3 should be connected to the tr8’s midi in. that’s all. the mpc as a master means: midi out of the mpc sends clock to midi in of the tb3 – from it’s thru output the tr8’s in will be getting the signal and all should run properly. both rolands should be set to clock external or auto detection (which is better).